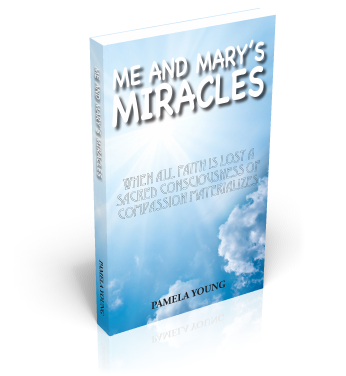 Me and Mary's Miracles by Pamela Young tells the true story of an average mother residing in Sydney in the late 60's along with her husband and three sons. Strange happenings begin to occur as the family experiences one tragedy after another beginning with the untimely death of her husband's mother. Then, tragically the family is torn apart by the death of one of her son's from a drug overdose. This is only the beginning of a string of deaths in the family over a period of eighteen months. Suddenly, compassion comes from a source she neither asked for, nor knew existed. Come find out about the compassion and comfort that came from another realm – the heavenly realm- that transformed her darkest days into her greatest triumph. Author Pamela Young's states, "I was not brought up in the Catholic faith. My forefather was a convict sent out to Australia from England and religion had not played a great part in my family's history. One of the facts that make this true story so enthralling is that in today's society, Mary Our Lady, should suddenly appear and have such a profound impact on, just not me, but also my family and friends. Therefore this gift of miracles is available to everybody." For more information visit Pamela Young's website. You may get your copy of Me and Mary's Miracles by Pamela Young at Amazon. Another Christian Book Marketing Author's Article Blast sharing the goodness of God with the world.